Breaking news today, Francis M died earlier in Medical City after battling with leukemia. First reaction after hearing the news, shocked and surprised. We thought that it was a false rumor or a joke (a sick joke to be exact) but after searching and reading a few articles on the net, indeed the news was true. Though all of us here in Manila are aware of his health status, everybody is expecting that he will survive the big C. Looking back at his past interviews, his doing well with his treatment and he doesn't look sick at all. In fact he looks perfectly healthy from the outside. Francis M was known to be the Master Rapper of the Philippines. 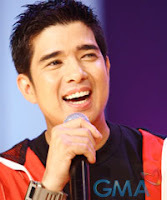 Apart from that, he was one of the hosts in Eat Bulaga (a noon time show in Channel 7). Francis is 44 years old. Too young to died. He still have a lot to offer in our country's music entertainment - more songs to sing, more records to sell and more collaborations to make with other music artists in our country. May you rest in peace, our dear kababayan. ako din nashock sa news na ito eh..